Madcap England 'Cilla' Retro dress with cool Vintage diagonal stripe detailing. Influenced by 1960s style, this soft jersey fabric A-line Mod mini dress incorporates Retro collegiate stripes and comes with cute block colour self fabric scarf so you can accessorise if desired. Demure Retro rounded neckline, floaty sleeve detailing. There's a hint of 1970s inspiration in the carefully selected colour palette. 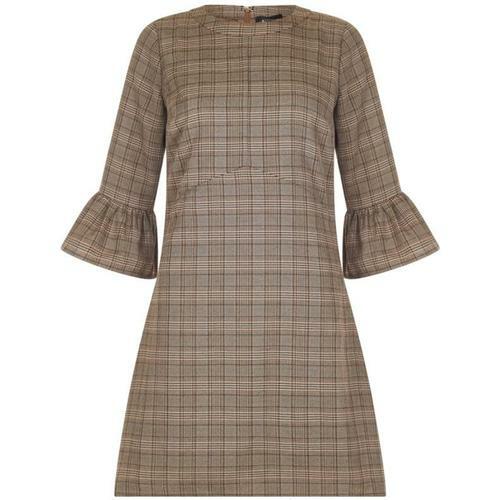 The Madcap England 'Cilla' Dress is sure to turn heads. 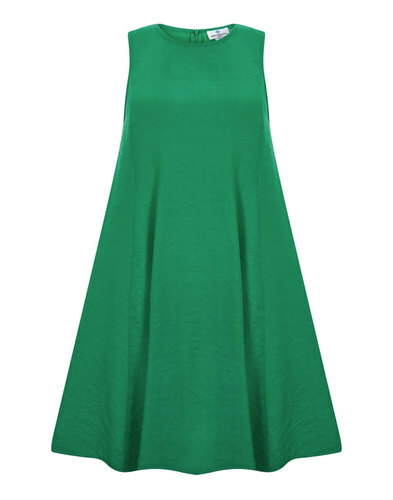 Striking colours on a simple yet stand out Mod dress. 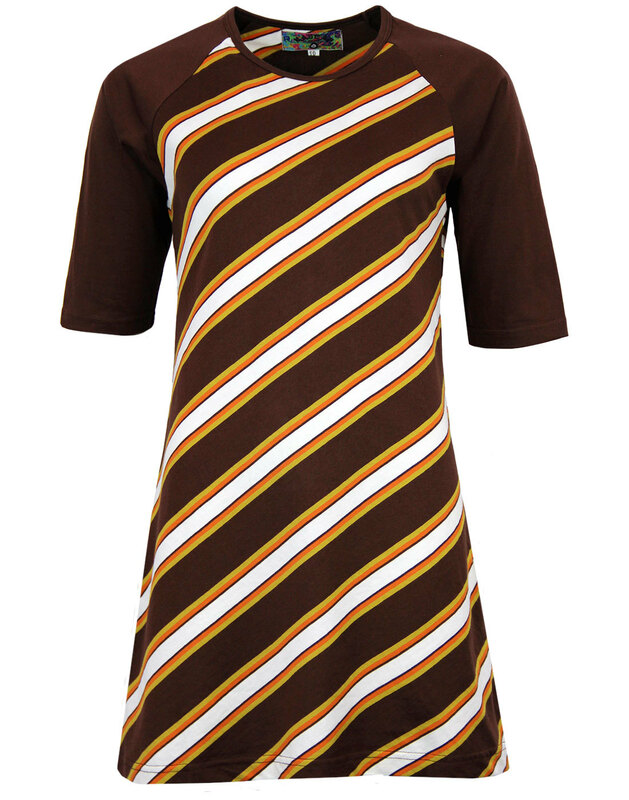 Madcap England 'Cilla' Retro stripe dress in coffee brown with mustard, orange and white diagonal stripe pattern repeat. Regimental stripe formation of that old skool Vintage collegiate look. 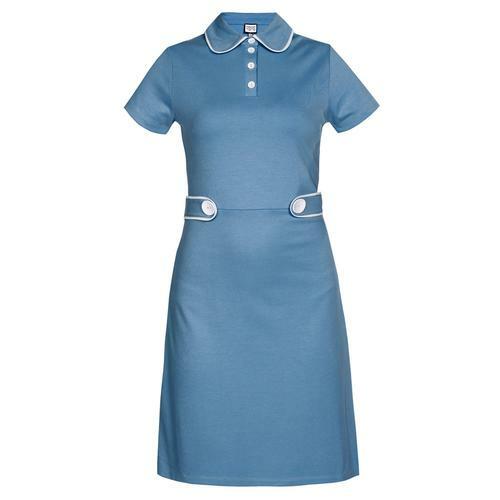 'Cilla' is a soft jersey 1960s Mod mini dress with A-line skirt and oversize short raglan style sleeves. Rounded neckline. Comes with a cool Retro block colour scarf that can be used to accessorise if desired. You can wear as scarf or as waist tie for two great looks. The Madcap England 'Cilla' stripe dress is both elegant and casual in equal measures. A real all rounder. Key Points: Madcap England 'Cilla' diagonal stripe dress with sleeves. A-line mini dress that comes with optional scarf accessory. Care: For best results hand wash at 30°. Please refer to garment care label. SKU: MC253 Cilla Dress with Scarf. Jersey cotton dress. 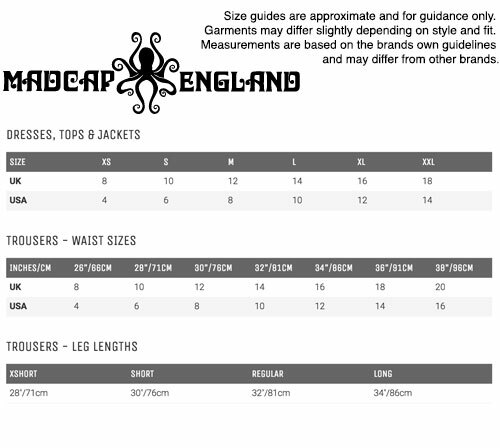 Choose size to fit.